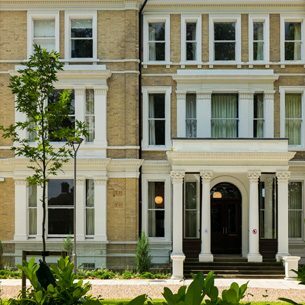 ‘The Green’ achieved the highest design stage BREEAM assessed certified score of 95.05% at its completion, winning multiple awards including best Multi-Residential building at the 2012 BREEAM Awards. 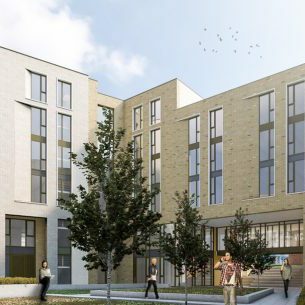 Located in the heart of Bradford City Centre the £30m ground-breaking student village consists of 1,026 study bedrooms across 34 four-storey ‘townhouses’ and six and seven storey ‘cluster’ apartments surrounding a social hub at its centre. 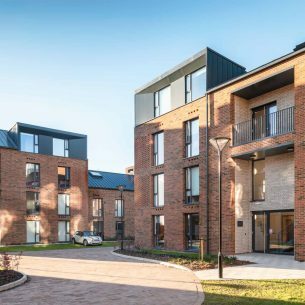 With a construction cost of under £30k per room an award winning scheme has been delivered within an 18 month construction programme which sets the bench mark for others to follow. 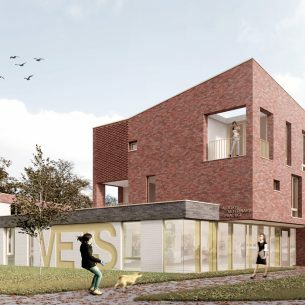 Designed to incorporate a range of features to enable students to live sustainably, including real time energy usage displays, a bio-diversity pond, external BBQ/social spaces, planting zones for ‘grow your own’ vegetables, solar thermal panels providing hot water and rainwater harvesting providing 50% of W/C flushing.’ The Green’ acts as an exemplar for sustainable developments illustrating high levels of efficiency intrinsically designed and over 20% of carbon emissions reduced by onsite renewable energy sources. Constructed utilising offsite construction of ensuite shower pods and prefabricated panelised timber frame system where the manufacturing process, materials and insulation used provides an efficient envelope whilst close attention to design detail and understanding of construction techniques ensured the buildings’ air tightness which significantly reduced the buildings’ base energy loads.